The Model DRZ-O is a real labor-saver on long jobs or working in a cramped area where the weight of the machine could get burdensome. 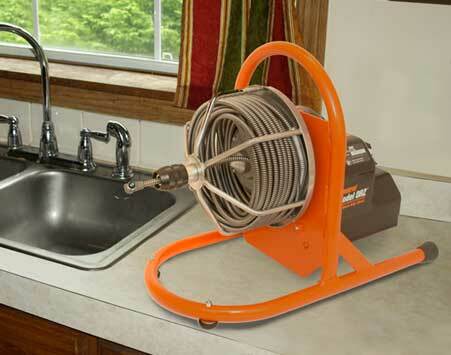 It’s ideal for clearing clogged sinks, tubs, and laundry drains in 1-1/4″ to 3″ drain lines up to 50 ft. long. The Model DRZ-O includes the patented Quick-Grip chuck to secure the cable during operation. With just a quarter turn, the three chuck jaws securely hold 1/4″, 5/16″ and 3/8″ Flexicore® cable for a wide range of small-line jobs. The Quick-Grip chuck can be released just as quickly to pull more cable from the cage. It’s faster, safer, and easier to use than a thumb screw. Operate the machine horizontally on the kitchen counter or vertically on the floor next to the tub. The silent motor is powerful enough to clear the line quickly yet won’t disturb your customers while on the job. Use the pneumatic pedal to keep your hands free to control the cable. Open cage lets you see cable condition after each rental; can carry 50 ft. of 1/4″ or 5/16”, or 35 ft. of 3/8” Flexicore® cable. The patented chuck tightens firmly on the cable with just a quarter turn. Three chuck jaws securely hold 1/4″, 5/16″ and 3/8″ Flexicore® cables.